Who Won this Week’s Thread Give-Away? Ahhhhhh. Embroidery Thread. Who among us doesn’t love the stuff? Well, this morning, I drew the winner of last week’s thread give-away, courtesy of Colour Complements. But I think there were several people who picked Sample Pack #5 as a favorite. And understandably, too – the colors are vivid and vivacious! Let’s cut to the chase, though, shall we? Absolute favorite? You’re kidding right? They are all gorgeous and it would be really hard to decide. If I were placing an order today, I would have to order some of the samplers. I particularly like Sampler #5 – the blues remind me of the beach. How I would love to be there instead of digging out from the snow here! I do a lot of paper embroidery for cards and I would like to try some of this these threads for that. Thanks for the opportunity to win such a great prize. At first, I was a little confused, as I didn’t see any blues that reminded me of the beach! To see more blues in this Sample Pack #5, you have to look at the second picture in the product listing. Congratulations, Pam! Please drop me a line with your mailing address, and I’ll send the information along to Lorraine at Colour Complements so you can work out the details of your prize with her. Thanks to all for participating! And thanks to Colour Complements for providing the fun! Lots of exciting stuff coming up on Needle ‘n Thread in the next few weeks, including another give-away that involves a book that’s in high demand, but no longer in print. It’s a favorite of mine, and I think you’ll love it, too. August 12, 2013 Overdyed Embroidery Thread – A Give-Away! December 3, 2018 A Stitcher’s Christmas, 2018: The Four Seasons in Thread! September 23, 2013 Silk Gimp – Give-Away! Congratulations Pam! I’m sure you’ll enjoy the prize! Would it be possible to give us an update and let us know your experience working with these threads? I’m sure many of us have the site bookmarked for ordering! Congratulations, Miss Pam! Hope you enjoy your thread! I hope everyone has a nice weekend! Congratulations Pam! Enjoy, enjoy, enjoy! How exciting to win such a wonderful prize! All of the threads are gorgeous. I will send you a pic of something I make with it. And good on you Pam. You are going to be embroidering some exquisite cards this year. Lucky recipients. 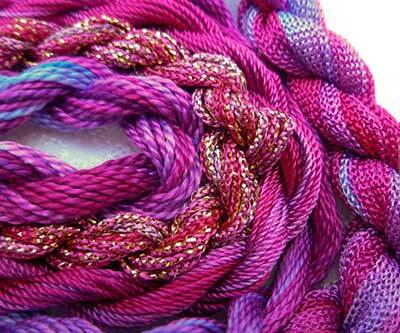 I feel like a winner too as have just ordered some tubular ribbon and chain sparkle for my underwater embroidery. A fresh motivation to finish it if ever there was one. Congratulations Pam. I imagine you’re smiling and dreaming of what to do next with all of these great threads. Enjoy every moment. I love browsing the site and wanted to “pin” it on Pinterest so I can share her great products. But it doesn’t come up with a photo when I hit pin. The point of pinning is to show off some of her goodies. Not sure what to do now. Congratulations Pam, I have used Lorraine’s beautiful threads and love them! Just a note… I ordered some colour complements threads after reading about them here, in case I wasn’t the lucky winner (Congrats, Pam!) as there were some limited availabilty colours that I fell in love with. They arrived over this past weekend and are really gorgeous. Lorraine is a delightful vendor. Will be planning a project (needlepoint) around her colours.